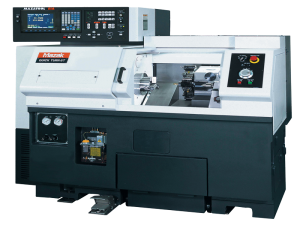 The QUICK TURN Series of CNC turning centers features compact machines designed for small workpieces, with high volume and high accuracy requirements. Offered in chucker and conventional configurations, the machines offer versatility and high efficiency turning capability. Tools and tool holders preset on a tool plate make it possible to perform new setups quickly and easily. (One tool plate included as standard equipment.) Especially suitable for repetitive production. (Featured) This system consists of a high speed gantry robot and workpiece stocker with 10 pallets that can stack workpieces making it able to be configured to meet a wide range of production requirements. 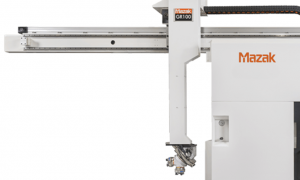 The gantry robot hand can handle two workpieces – raw material and finished workpiece – simultaneously (max. 80 mm (3.15 in_) diameter x 0.5 kg (1.1 lbs) weight), allowing unmanned operation to be performed for very short cycle times. 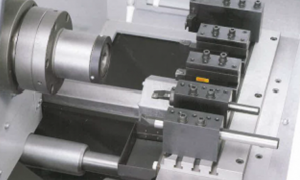 The bar feeder system enables automatic operation to be performed for extended periods for workpieces with short cycle times. The large bar material capacity (max. 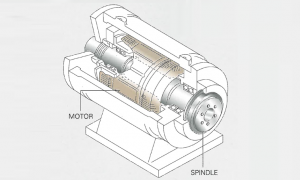 32 mm (1.26 in) diameter/36 mm (1.42 in) – option) allows this system to process just about any small part.